When Monica Valerio sold her house in the Bay Area last month, a huge weight lifted off her shoulders. For Valerio, it was a sign that she had survived the harsh U.S. recession and its after effects. After losing her full time job in 2009, life had become very harsh for Valerio. She made ends meet by working several part-time jobs and always felt extremely anxious about losing her home in Alameda, California, where she has lived for 33 years. But now she has sold the house and bought a condo in Las Vegas to be near her daughter. She plans to live a retired life, with savings that she hopes will be enough to get by. "I can't tell you how good it feels -- all that stress has been lifted," Valerio, 60, says. "I'm going to be okay." On Friday, the monthly U.S. jobs report will offer the latest official pulse on America's economy. Already, America is near full employment and the jobless level has been hovering right under 5%. Overall, Americans' confidence in their job opportunities is at its highest point in 15 years, a Pew Research survey found. And consumer confidence too is at a nine-year high. Valerio is like many Americans, who see their own economic lives looking better during this long, sluggish, recovery. A sense of survival weaves through their stories. Monte Galbraith has had a tough year. Sales at his denim manufacturing plant, Denim North America, in Columbus, Georgia, are down a bit this year. He had to lay off four workers at his 200-employee company. Galbraith knows hard times. The textile industry has been hit especially hard by global trade. His factory has lost 100 workers over the last 15 years. But Galbraith sees better times ahead next year. He points out that consumers are feeling better and he anticipates denim sales will pick up at the start of 2017. If America's economy keeps adding jobs, Galbraith sees that as good for business. He believes he'll be able to hire back the four workers he lost by early next year. "[Business is] slower this year than it was last year," says Galbraith. But: "I do think that I'm going to be okay." Erlinda Delacruz lost her manufacturing job in 2009 and has only found part-time work since. After her home was foreclosed on, she had to move in with her daughter and her three kids for a year and a half. 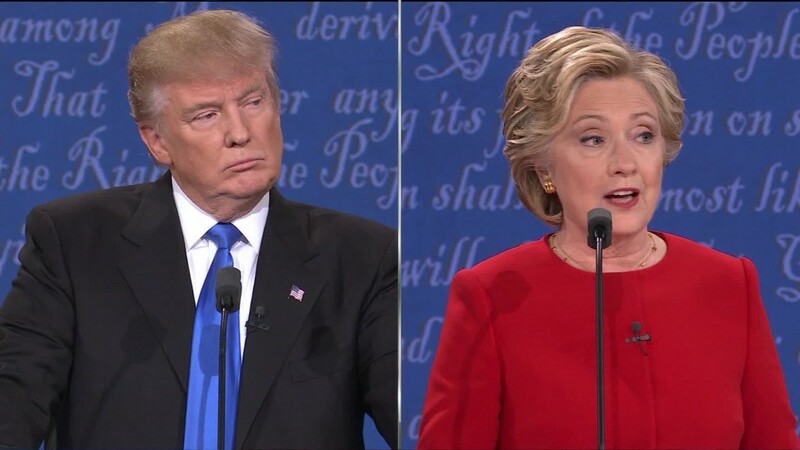 Then late last year she won a major victory when she scraped together enough money to buy a small, one-bedroom home in Winters, Texas. Times are still tough. Delacruz lost one of her three part-time jobs at a senior citizens center a month ago. 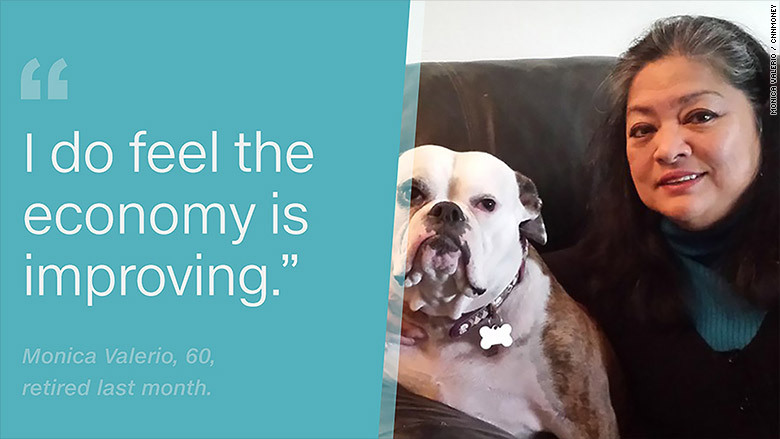 Her income went down to about $1,450 a month from $1,600 a month -- that's $150 less that she really needs. She misses her old manufacturing gig. "There's hardly any production jobs left...it's all retail now" she says. "If we had more production jobs I think the United States would be better off." 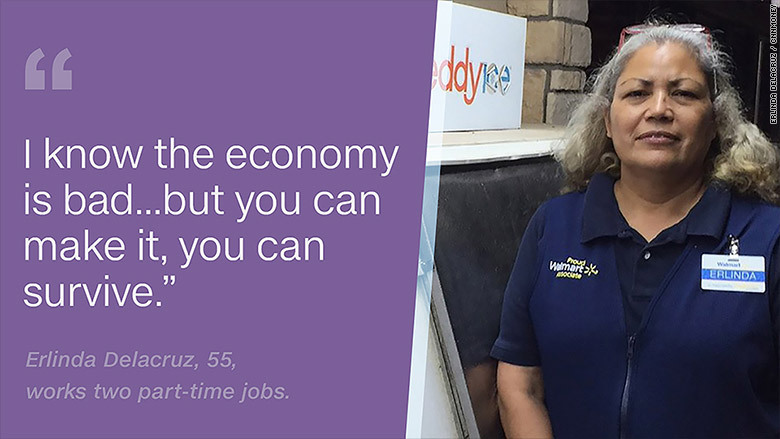 Her other employers, Walmart (WMT) and convenience chain Wes-T-Go, gave her some additional hours and she works about 60 hours a week. Despite her job struggles, she feels optimistic after buying her home and says she'll continue to persevere. "I know the economy is bad, it's been bad for years, but you can make it, you can survive," says Delacruz. 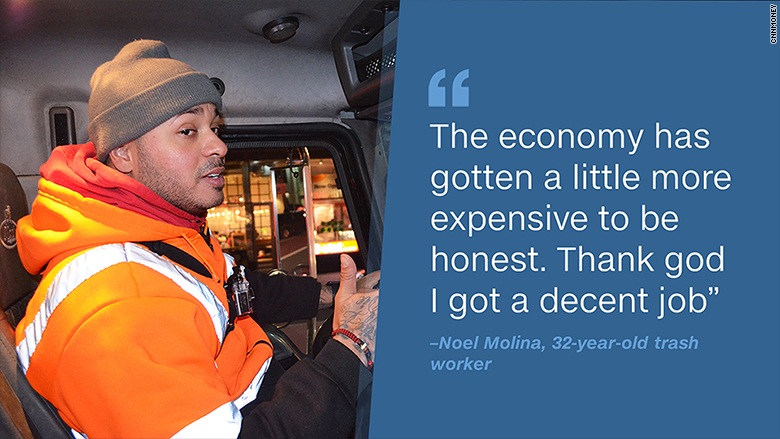 Noel Molina is grateful for his full-time job picking up trash in New York City and working 55 to 60 hours a week. "Your trash is my money," he likes to joke. Molina made $112,000 last year and anticipates making about $115,000 this year. He's consistently gotten a raise that last few years, he says. His job made a longtime dream come true this year: Molina bought a 4-bedroom home in Freeport, New York, for his family of three kids. But his costs have gone up -- Molina is now paying $2,900 a month in mortgage payments, a lot higher than the $800 a month he used to pay in rent. He's happy to give his kids a place outside New York City, where he lived for 17 years. But he's just learning how hard it is to be a home owner, and how quickly the costs are piling up, between gas and electric bills and renovating his basement into a "man cave." "The economy has gotten a little more expensive to be honest. Thank God I got a decent job," Molina, 33, says. 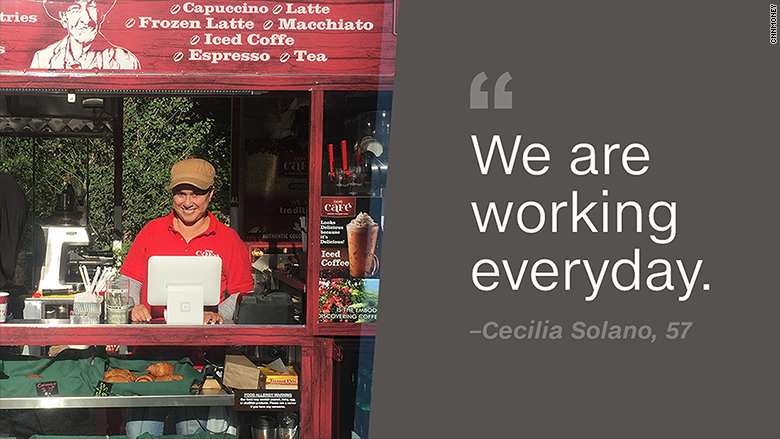 Cecilia Solano started serving coffee in New York City's Central Park two years ago. The Don Cafe Colombian coffee stand was a crowd favorite on a recent weekday. But it's tough work: Solano and her husband, along with two employees, work six to seven days a week, she says. "We are working every day," she says, juggling an interview with customers' orders. Solano says she arrived in New York from Colombia 20 years ago and now lives in Queens, N.Y.
After working as a skin care esthetician at a beauty spa, Solano, 57, and her husband opened up the coffee stand in 2014. Sales are up this year compared to last, she says, and they're saving up to open a cafe in Colombia soon. She acknowledges how slow the recovery has been but appreciates that things are, finally, improving. "The economy has grown very slowly," she laments. Then her voice picks up, "But -- it has grown."